I'm back from a little break I took, not to relax, but to study. Blergh. Anyway! I'd been hearing all these rave reviews of this one foundation - the Giorgio Armani Luminous Silk Foundation (as used on Kristen Stewart in this makeup look). I looked it up, and it is supposedly one of the best foundations in the market. It has been used by the likes of Kate Beckinsale, Rosario Dawson, Kristen Stewart, and Kate Winslet, to name a few. Pictures on this post are all of celebrities wearing the Luminous Silk Foundation. It has sheer coverage, and enhances your skin's natural glow. It creates a true-to-its-name luminous glow, which is something I am quite obsessed with these days. I, of course, got extremely interested. I started looking around eBay for a good bargain, but it is quite impossible to find a listing of this foundation - maybe because there are quite a few shades to choose from, and you could easily go wrong if you don't check it out at a Giorgio Armani cosmetics counter before buying. If you're keen on buying at home - use this foundation shade-finder to find the closest shade to your skin colour. I finally found an eBay listing for a shade close to my skin tone. I was really busy with all-day classes, though, so I didn't really pay much attention to the listing or when it was to end. Last night, an email reminder told me that the listing was ending soon. This morning, I set my alarm to 7AM, and woke up to find my boyfriend on the computer next to me, bidding on the foundation. So sweet! 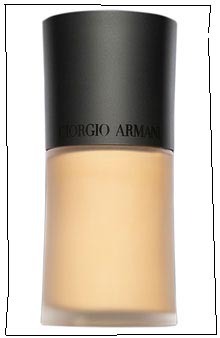 Giorgio Armani Luminous Silk Foundation retails for about AUD 98 in Australia, and USD 59 in the States. Malaysian buyers, they have a GA Cosmetics counter in KLCC.